The Valmod Pack comes in two different flavors. The Expansion pack and The Overhaul pack. The Expansion pack is meant to be viewed, as the name implies, as an expansion pack for the game. What this means is that it adds a bunch of new features to the game without dramatically changing the overall vanilla gameplay experience. Great if you're happy with 7DTD but just want to have more stuff to do. The Overhaul pack adds the same items and content to the game as the expansion with the key difference being that unlike the expansion the overhaul, as the name implies overhauls some basic aspects of the game. Mainly the recipe system is considerably locked down compared to vanilla. The overhaul is intended for those who want a new experience from the game. Click the Browse local files button. Open the Valmod zip. Open the first folder inside. 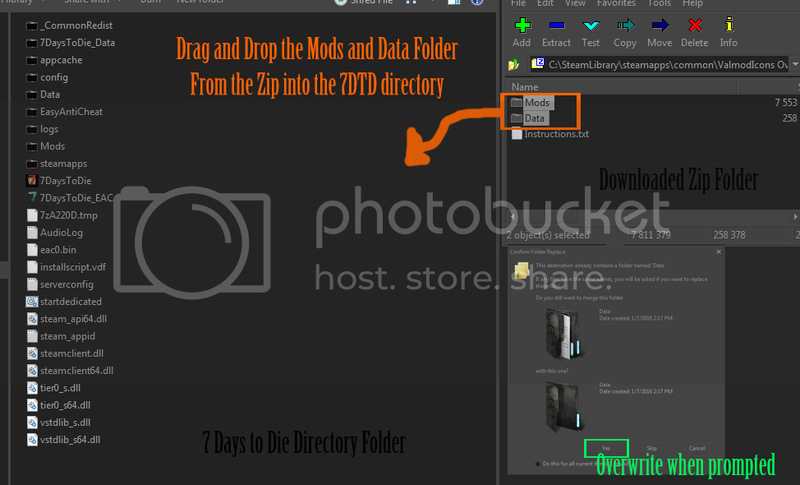 Inside is a Data and Mods folder. Drag and drop these folders into the game's directory, overwriting when prompted. When you start the game you will be given a Class Selection book and a Class Key note. With the Class Selection you able to craft/choose one of several classes. Search for “class” in the crafting menu to see the available options. After you decide on a class you get a class briefcase that you then place on the ground and open either with your class key or by breaking it. This unlocks the case which then can be looted to get all the class-specific recipes along with a bundle of starting items related to the chosen class. Note: Classes only determine your starting gear. They do not lock you out of learning anything else, you can still master everything. Warning: this guide is not yet updated to A16. There are a few new workstations added to the game. Armory (Overhaul Only) – This workstation is required for crafting armors. Each tier of armor requires a different tool in the workbench to craft. Cloth and animal hide require a sewing kit, leather requires a tanning rack and iron and steel armors require a welding torch. Merchant Delivery Box - Craftable vendor to buy supplies from. Quest Board - Craftable vendor to buy quests from. Install ontop of Overhaul to get lethal headshots, larger hordes and disable climbing zombies. DOES NOT WORK WITH EXPANSION PACK. OVERHAUL ONLY. Servers and credits listed in below post. Valmod is compatible with servers however those who play on the server will have to install the mod locally to get the full experience. If you'd like your server listed here please let me know. Also note that the below servers are ones shared with me by users. I am not responsible for their stability or server moderation. If one of the servers listed are no longer active please let me know. Valmod Overhaul, Active Admins, friendly community, trader mall, admin poi's, admin bug fixes. Mainly a PVE server with PVP zones and towns and a main mega trade hub where it is controlled by players. Had mode server and a loot cave challenge in main PVP city. This is the format I use. This is more for my benefit than anyone else, pay it no mind. This mod pack also supports the 7D2D Mod Launcher, making it even easier for clients on servers to keep their files up-to-date! Big thanks to LokiTheWeaver, Kalrath, 40QuidKidd, Ethena, StompyNZ, RedEagleLXIX, Sirillion and JaxTeller718. There are others, of course, but I'd be here all day if I was to name everyone. Thank you. Note: My UI is based off of Sirilions's work. 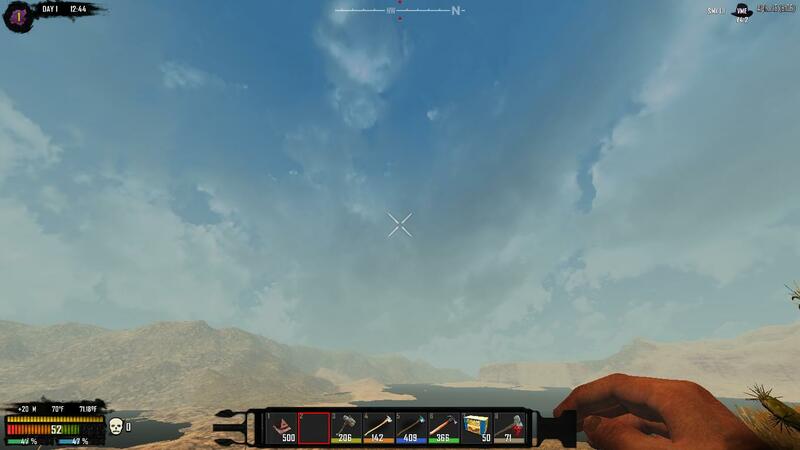 You can find his original UI here: Sirillion's SMX UI Mod. Last edited by Valmar; 12-30-2016 at 04:10 AM. Wow, whole lot of nice stuff here to check out. I'm really digging the classes idea, it's something I fully expect to be implemented into vanilla someday along with starting locations (eg: hunter starts in a log cabin in the woods) which makes a lot more sense than "I'm naked in the woods and suddenly apocalypse". Last edited by Xamllew; 08-03-2015 at 03:02 AM. It's good to have a one-stop-shop for all things Valmar. I've gotten a lot of ideas from your frequent posts and your code in the short time I've been here. Thank you for that. Your mods are very much along the same lines as my approach. I'd use them wholesale, but I prefer slow and careful integration so that I can maintain my understanding of everything that's going on in the code. Looks like alot of thought went into this, kudos. Curious as to how you choose "classes"
Thank you. I'm very much hoping my little class system setup is made completely irrelevant in A14. I'm sure whatever the pimps come up with will be much better. Still, was fun to make. You humble me. Slow and careful is the best approach to have, I think. To give a bit of perspective I've been working on the class system alone for like a week. Im not sure what standard should be used to determine if thats a long time but for me it feels like its been a long time. Its nice to finally have it out there. I described it in the OP but I perhaps wasn't able to be very clear on the steps. I was fighting text constraints - I had to shorten a lot of things just to get that post to fit. I dread what I'm going to have to do whenever I start adding more changes. "When you start the game you will be given a Class Selection book and a Class Key note. You place the Class Selection item in your crafting grid starting from the top left corner and onward to decide which class you want. After you decide on a class you get a Class briefcase that you then place on the ground and open either with your class key or breaking it. This unlocks the case which then can be looted to get all the class-specific recipes along with a bundle of starting items. " So here's my question: Was that not clear enough on the steps or did you only skim through it? I'm not asking to be narky or defensive or whatever, I genuinely want to know. I'm not very good at explaining things to others so I would like make simple, clear instructions for it so that its easy to follow. If my original post was unclear on that then I'll try to fix it. Though I'm not really sure how else to explain it. Note: Noticed I'm missing a few recipes, doh. Thought I did those. Will fix. I'd say highlight the sections. I appeared to have lost it in the wall of text. "When you start the game you will be given a Class Selection book and a Class Key note. You place the Class Selection item in your crafting grid starting from the top left corner and onward to decide which class you want. After you decide on a class you get a Class briefcase that you then place on the ground and open either with your class key or breaking it. This unlocks the case which then can be looted to get all the class-specific recipes along with a bundle of starting items. Or something, I just lost it despite trying to find it, admittedly I only re-read the post 3 times. I'd take advantage of the alliteration or the word "Class"
It also, nd this is not negative criticism, couldn't hurt to show us a demonstration video, or picture-walk through. Last edited by h0tr0d; 08-03-2015 at 05:02 AM. I forgot to add the iron crossbow recipe book. Funny since I remembered the note. Well, fixed now. But I get what you're saying. I'm not sure I can make it quite as clear as you lay out. Its no joke when I say I had to go through it deleting SPACES just to get enough room in the post. As for walkthroughs it would be nice but I just dont know what exactly to show. It isn't exactly complicated in the first place. What is there that needs to be explained in a video? Update: Was able to squeeze in some bolt text. It isn't much but it should help. Maybe. I think. Last edited by Valmar; 08-03-2015 at 05:20 AM. This is badass! You are becoming one of my favorite modders-to-watch! "It is a puzzling thing. The truth knocks on the door and you say, 'Go away, I'm looking for the truth,' and so it goes away. Puzzling." Last edited by h0tr0d; 08-03-2015 at 05:51 AM. "Anyone interested in taking the mod apart, combining it with others, modifying or anything are free to do so, no need to ask. Do whatever you want, just try to have fun. " Have at, Hoss. If I cared about people using these things I wouldn't share them in the first place, right? No need to worry about credits for anything of "mine". No one reads them and it only adds more stuff to worry about. Not that I'm telling you what to do, of course. That's kinda the point. Do what you want.